Nature, the British scientific journal founded in 1869, is not in the business of fear-mongering. But its March cover story may have raised some eyebrows about the nature of Alzheimer’s disease. The article, written by Allison Abbott, considers the notion that, under very specific conditions, Alzheimer’s could be transmitted to other people. How could this occur? A key element is human growth hormone, which is produced naturally by the pituitary gland and governs growth. For many decades, pituitary glands have been salvaged from cadavers for the hormone that can be used to address growth-related problems. I first learned about HGH in the sports pages. After decades of allegations that many baseball players and other athletes were using steroids to gain a competitive advantage, major league baseball belatedly cracked down on the practice. But as steroid use declined, human growth hormone gained in popularity. How could human growth hormone transmit Alzheimer’s? Abbott interviewed John Collinge, who has been examining human brains for the past quarter-century. While studying the brains of people who at some point had been injected with growth hormone, “It turned out that some of the preparations were contaminated with a misfolded protein—a prion—that causes a rare but deadly condition,” Creutzfeldt-Jakob disease. Unlike Alzheimer’s, which often takes at least a decade to do its dirty work, Creutzfeldt-Jakob typically kills within a single year. Collinge, Abbott wrote, was disturbed by the implications: “That the plaques might have been transmitted from one person to another. If true, they could have far-reaching implications: the possibility that the seeds of the amyloid-β protein involved in Alzheimer’s could be transferred during other procedures from one person to another,” through common medical procedures such as blood tranfusions and organ transplants. My takeaway is this: It’s always good policy to take precautions in a timely fashion. But, at this point, the odds of any one person being afflicted by this disease is exceedingly small. Having a bicycle has been essential for me ever since I learned to ride one. That was in 1968, when I was seven years old. I’d been practicing on my brother’s hand-me-down when I experienced something akin to Orville and Wilbur Wright’s excitement 65 years earlier. I remember racing down the hill into our yard to announce the momentous news to my mom. By fifth grade my friends and I rode on our own all the way down Chuckanut Drive, a serpentine coastal highway noted both for its beauty and its hazard. The purpose was to search for fossils, under the supervision of a fifth-grade teacher, but my two friends and I rode past the intended site and ended up in the village of Blanchard, Washington, ten miles from where we started. Two years later, in 1975, I somehow persuaded my parents that it would be OK for me and three other middle school students to ride without adult supervision almost 40 miles to Anacortes, from which the ferry would take us to Orcas Island, the largest and hilliest of the San Juan islands. Things did not go smoothly. My new bike, a Follis (pronounced Folly) lived up to its name. It was perhaps the worst touring bicycle ever to come out of France. But I can’t blame the accident near Blanchard on my bike. My friend Jack and I got too close to each other, and my pedal caught in his spokes. Neither of us was injured, but Jack’s front wheel was mangled. It seemed that our trip had ended in utter failure. But Jack called his dad from a pay phone, and within an hour his father dutifully delivered by car a new front wheel he happened to have in his garage, enabling our ride to continue. The last five or six miles on our way to Anacortes was alongside a highway expressway, amid much debris. A couple hours later, when we were getting off the ferry, one of our bikes was almost crushed by a camper. One of the evenings we spent on Orcas, my friend Cary spied an alarmingly large-winged insect. When Cary tried to kill it by swinging his unattached bike rack at it, it was the bike rack itself that was destroyed. I have a vague recollection, perhaps inaccurate, of Cary’s sleeping bag draped over his shoulders as we made our way from Moran State Park to the ferry terminal. Could that have been possible? How could he have steered? In any case, we were overmatched. For me, it would not be the last time. A few years later, the high school’s wrestling coach invited me and another boy to ride from Bellingham to the Mount Baker ski lodge. Actually, we made the ride twice. The first time, we rode only the twenty-plus final miles: fourteen miles through rugged foothills, followed by eight miles of switchbacks. I had never experienced pain like it. I was wearing jeans, which were not loose-fitting, and my quadriceps were rebelling. The following week we did the entire distance from Bellingham and back, more than 100 miles. I did that ride four straight years, but it was the ride in 1979 that left the strongest impression on me. It was a chilly early-May morning and, unlike my friend Chip, I was not dressed appropriately. No ski cap under my helmet, no warm jacket, no thermal underwear. My flimsy pair of Army fatigues had a hole in the thigh the size of a baseball. Somehow, we got separated from our mentor, who, doing the sensible thing, turned back toward Bellingham and trusted that Chip and I would make the same decision. But we didn’t. We didn’t want to be perceived as quitters. By the time we reached the shelter of the ski lodge, I was showing signs of hypothermia—in particular, confusion. I remember feeling resentful that none of the cars or trucks that passed us asked if we wanted a ride. As in so many other misadventures of my teenage years, my luck held out. Chip, cold but still coherent, immediately identified a classmate of ours, an employee at the lodge. We ate large bowls of chili, and within an hour or so we were in our classmate’s pick-up truck, our bikes in the truck’s bed. Why did I write about bike riding this week? Because my friend Matthew Abbate and I are now officially in training for a metric-century (62.2 miles) “Ride to End Alzheimer’s” event, which starts and ends in the coastal New Hampshire town of Rye on Saturday, June 11. Our initial step is to raise $1,000 to qualify for the race, but I’m confident we’re capable of raising much, much more. but by early next week we should be in full fundraising mode, including on Facebook. A sea change in attitudes? On Wednesday evening, I took part in a forum on Alzheimer’s at the Somerville Library. The forum grew out of a grant I received from the Somerville Arts Council in connection with this blog, and as the event was approaching, I was obsessing about getting a respectable turnout. What would I deem “respectable”? Perhaps twenty. Once, more than a decade ago, when I was promoting a book of mine, I did a reading in front of a quite exclusive group: one acquaintance of mine, along with one of the librarians and an elderly woman who appeared to be far along the dementia spectrum. This was at the end of a number of readings I’d done, including well-attended sessions in Chicago and Brattleboro, Vermont. But the lesson from more than a decade ago was fresh in my mind: If you want people to come, you’ve got to reach out to as many people as possible. With the help of Paula, librarian Cathy Piantigini, and a fellow panelist, we were able to pack the main library’s lecture room. I was one of two panelists to speak directly to the experience of having Alzheimer’s or a similar disease. I highlighted the importance of recognizing that while Alzheimer’s lacks a cure, those of us who are still in the early stage of the disease can expect to live, on average, ten to fifteen more years after their initial symptoms—far longer than people with most incurable diseases. A fellow panelist spoke fluently about dealing with Posterior Cortical Atrophy, a variant of Alzheimer’s that affects vision. I wasn’t taking notes during all of Zeisel’s excellent presentation, but the takeaway for me was this: People like me and my fellow panelist represent a sea change in attitudes toward dementia. While not everyone with Alzheimer’s wants to disclose their diagnosis publicly—particularly if they are still employed—coming out is now more acceptable than it has ever been. It wasn’t until the famous World War II-era actress Rita Hayworth divulged that she had the disease in the 1980s that Alzheimer’s emerged into the public consciousness. And there is still a ways to go. Last September I wrote about the book and movie about Alzheimer’s, Still Alice. First I read the book, which was informative, but in one key aspect hugely misleading. Nowhere did the author, Lisa Genova, make clear that the main character had a particularly fast-moving variant of the disease. As I noted during the forum, Still Alice depicts a fictional character who within a mere two years is reduced to a state of utter helplessness. Novelists and filmmakers are under no obligation to treat medical conditions accurately or fairly, of course. But I can’t help thinking of some anonymous person with mild cognitive decline being totally freaked out by the possibility of being reduced to an almost infantile state within a mere two years—and therefore being too afraid to be screened. This is not the way to encourage people to confront a disease that is a good deal less horrifying than most people assume. Absent-mindedness and a poor sense of direction have been lifelong companions of mine. In elementary school I was well-known for leaving my coat on the school’s playgrounds. And in adulthood, my directional skills have been consistently weak. On a trip to New York City with a couple of friends in the mid-1980s, I managed to lead us late at night directly into the heart of the Brooklyn neighborhood Bedford-Stuyvesant. Why did we know this could be a dicey place for us white guys? Because we learned so as teenagers from the Billy Joel song: I’ve been stranded in the combat zone/I walked through Bedford-Stuy alone. We reversed course immediately. Almost three decades later, when my son started college at George Washington University, Paula and I began making the road trip to D.C. twice a year. Typically, we drove together, but in the last two years I made the drive on my own. In the spring of 2014, this almost led to a debacle. I plugged Andryc’s dorm address into my GPS unit, and that’s when the problems began. Why was I being told to follow a southeast path, when Andryc’s dorm was in the city’s northwest quadrant? Soon I crossed over the Anacostia River, and then it was clear that my GPS had betrayed me. I drove around in a circle in Anacostia’s commercial district, and the voice in the machine kept telling me to make a U-turn. Fortunately, it was still daylight, a gorgeous spring evening. I stopped to ask for directions from an African-American family grilling meat in their front yard, and soon I was heading across a bridge toward the Capitol. My troubles were just beginning. I could see the Capitol, and I knew I was moving toward it. But when I got closer to the massive edifice, it seemed that everything was blocked with bollards or one-way streets. Was I moving in the correct direction? I wasn’t sure. Compounding my worries was that Andryc’s dorm was tricky to find—close to the Watergate hotel, but easier to get to by foot than by car. Eventually, I found a place to park, in the hope that I was within walking distance of his dorm. It was then that I realized my phone was almost out of juice. I called him, and was much relieved to learn that, yes, my car was within walking distance. Ten minutes later, there he was, my grown-up son, more in control of the situation than I was. A year later, our hook-up went smoothly. But on the drive back home, I grasped that this would be my last drive of this length in such a short time—almost 1,000 miles in 36 hours. After stopping in Danbury, Connecticut, where we fortified ourselves at an excellent Brazilian buffet, dusk gave way to darkness. When I reentered Interstate 84, I’d lost my nerve. It was as if my rear-view mirror had been transformed into a video game, the kind with malevolent intent. Cars coming up behind us were especially unnerving. Was it just a matter of time that someone would collide with my Toyota Matrix from behind, splitting the car in half? Never have I been more relieved to reach the orderly calm of the Massachusetts Turnpike. I knew that I’d never again drive such a distance in such a short time. phage a combining form meaning “a thing that devours,” used in the formation of compound words, especially the names of phagocytes. Last July, about a month after my diagnosis, I learned about a biotech company called Neurophage, whose ambitious aim was to create an entirely new approach to treating Alzheimer’s. This was around the time I was preparing to launch my blog, and its heading—The Diminishing Window—reflected my sense that it was unlikely a cure would be developed in time to help me or anyone else already diagnosed with the disease. Occasionally I would do a news search for Neurophage, but all that would come up were the same stale articles. Last week, something fresh did spring up. 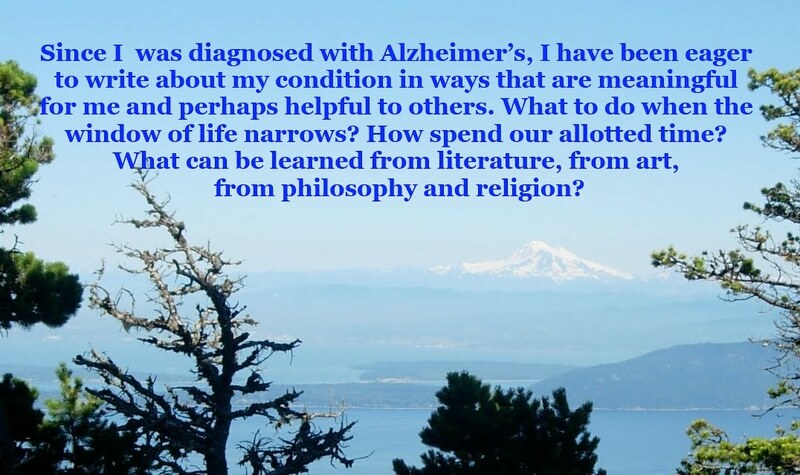 The website of one of Boston’s public television stations excerpted a section from the book, Brain Storms: The Race to Unlock the Mysteries of Parkinson’s Disease, by John Palfreman, a retired University of Oregon journalism professor who has Parkinson’s himself. (Parkinson’s and Alzheimer’s, as well as a number of other neurodegenerative diseases, share similar features.) Though I was aware that Neurophage was pursuing a novel technique, I didn’t grasp how significant this technique could be until I read Palfreman’s lucid account. The starting point to understanding this approach is “phages,” shorthand for “bacteriophages”—microbes that live in disparate environments, including human stomachs. Phages were unknown until Beka Solomon, a scientist at Tel Aviv University, discovered them in 2004. She was working on what was called the M13 bacteria, with an eye toward treatments for Alzheimer’s and similar diseases. The key question, of course, is whether the clinical trials will deliver on their enormous expectations. Much is riding on the outcome.